Just like every classic album, sometimes greatness needs a little bit of fine-tuning to stand the test of time… The same goes for make up, and Huda’s breath-takingly beautiful Rose Gold Remastered Palette maintains all the things that you LOVED about ‘Rose Gold the First’ with some stunning enhancements in answer to customers’ feedback. Metallic shadows might show an uneven surface due to back-injection production methods, which ensures maximum pigment and a creamy texture. The shimmer shades add such a wonderful look to the eyes....its a great palette for glam looks. This is awesome and a beautiful palette. Highly recommend. I love this palette! It's so pigmented! Huda my favorite! Must have! Received this lovely pallet today, and couldn't wait to use some of the colours. I love the equal number of mats and shimmers, 9 each, and the way they're laid out in the pallet. The colours are vibrant, and very pigmented. The shadows blend really well, and they last all day, without budging or creasing. It is on the pricey side, so a bit of an investment, however you get what you pay for sometimes, and in this case, the quality is second to none, and I have many shadow pallets, it's kind of an obsession! So if you're thinking of an interesting and really good quality eye shadow pallet, look no further. And finally, delivery from cult beauty is prompt, as always, and all products arrived in great condition and packaged well. I love this palette! All the colours are very pigmented so you don't need a lot of product. The shimmers are also great and blends with the other shades with ease. It is a bit expensive, but I think it's totally with the money. 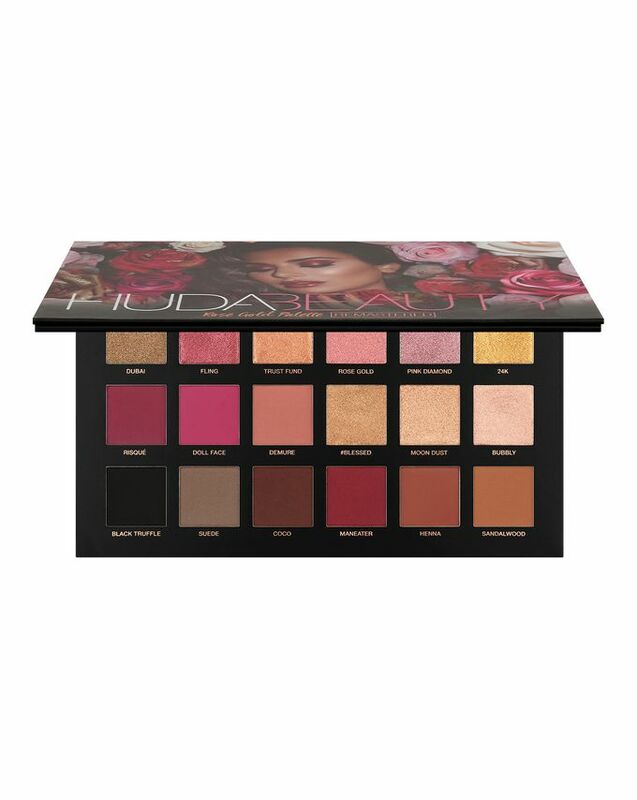 I purchased this palette a while a go, purely based on the hype surrounding it and how amazing Huda Beauty is. I loved the look of the colours and was particularly intrigued by how it had been remastered - surely you can’t go wrong with that? Well I have to say I’m extremely disappointed especially having spent so much money on it. I’ve had cheap drugstore palettes that are far better quality than this. The shades practically hate each other - they refuse to blend, irrespective of what brush I use or if I use a primer or not. Although the shades are very bold and prominent on the eye, they aren’t actually as pigmented as everyone claims. Each time I just end up with in-your-face eyeshadow that’s patchy and just a bit ridiculous. I have incredibly fair skin and I have to say this a palette definitely aimed at people with darker and warmer undertones - they all look incredibly orange-toned on me. All in all this palette is incredibly difficult to work with and despite my best efforts to make a half-decent eyeshadow look with it, I always end up wiping it off. Save your money and go with a different product. Fantastic palette, gorgeous colours, very pigmented, and a joy to apply. Very pleased with my purchase. Was super reluctant about buying this mainly due to the price. BUT The colours are divine, the formula is amazing, the packaging is gorgeous AND the quality of the item is exceptional. Definitely recommend! Save your money guys, it’ll be WORTH IT. I really like it after receiving it. Not only is it beautiful and fine, but also its colour and ductility are very good. I strongly recommend it. Very pigmented, such a versatile palette able to create casual or dramatic looks. Highly recommend. Highly pigmented and very beautiful colours. Haven't stopped using it since I bought it. It seems to have not achieved the effect of publicity, not as amazing as I expected. The packaging design is gorgeous, the color matching is attractive, the powder is fine. I usually use a fluffy eye brush to get the delicate pearl effect I want. The net content is much less than the desert palette. Generally speaking, it's not worth the price. Just an okay product. This palette deserves all the praise in the entire world. Highly pigmented and easy to blend.however the top extreme right shades are a little buttery so you might need to use fingers to apply. You have to play with a little to see what works for you. Soo prettty and very pigmented! I’ve waited a long time to purchase this because one it’s expensive and it was remastered this year. After watching reviews on YouTube and Instagram I’m really glad I waited and got the palette that has beautiful packaging and more importantly the pigments are great! Very easy to blend and already one of my favourite palettes! 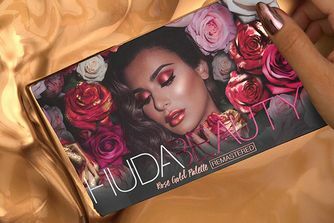 Looking forward to future releases by Huda Beauty! Amazing for pros and newbies! The glitters in this palette are beautiful. Since you can apply it with your finger - even a person just starting to use makeup can do it and look amazing! The colors are very pigmented and beautiful- for someone with little experience with eye shadows, it was a bit hard for me to learn to skimp on it - because the shadows are so pigmented I had to learn to use little amounts. This will make the palette last longer! Also the reason I specifically bought this palette and was ecstatic when it was remastered was because it is perfect for travelling! I don't need to carry blush, eyeshadow kit, eyeliner, setting powder or highlighter! Just this palette, beauty blender and a few brushes! Huda has a tutorial on using this palette for full face as well! Another thing - my baby dropped this palette several times! Unlike the urban decay naked basics palette which disintegrated in my luggage, this one stayed intact! I love it so much, shadows blend so easily. Bright colors do not require too much effort to create beautiful eyes like painting. 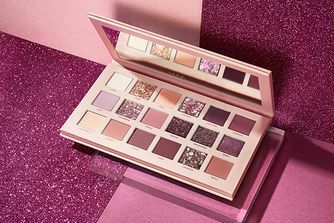 This palette is amazing, I have the original rose gold palette by Huda Beauty and I use it almost every day. Since buying the remastered palette, I haven't looked back. As long as you use an eyeshadow primer (I use Too Faced shadow insurance) the eyeshadow will stay on forever. The mattes are so easy to blend and omg the shimmers are to die for. Perfect for day or night. I receive so many compliments when wearing this. I was really looking forward to getting this. The shadows don't blend easily, and some not at all. The shimmers can only be used with fingers and they fall all over my face and transfer to my upper lid. Through the day I end up with glitter all over my face. I find the mattes even creamier than the original (both still quite dry shadows compared to abh) but the ‘textured’ from the original are so much more pigmented and the staying power is unbelievable. After seeing the success of the first palette, I was overjoyed when I had seen that this palette was coming out with supposedly fixes to any issues that existed in the first. First of all, the packaging is insane. It's gorgeous. The palette itself is really well made and feels luxurious. It comes with a thick shade protector sleeve to place in between the big mirror (yessss) and the shadows. It is a palette you want to display on your vanity. It's easily one of the most beautiful palettes I've seen. The shadows look completely amazing. The shimmers are beautiful to look at and the mattes look like they are highly pigmented. While I don't rely on swatches as performance can differ significantly upon application, I know a lot of people care about them so I'm going to factor this in for those of you that use them as an indicator. Upon swatching, the shimmers are slightly creamy and a good texture with just the right concentration of shimmer so you do not look like you've just dumped glitter straight onto your eyelids. You can safely use these shimmers on a night out, a day in the office or just for everyday. The colour differentiation in the shimmers when swatching is slight but noticeable. The top row of shimmers offer the most variance. The three golden shades on the second row are barely distinguishable upon swatching. The mattes are not the best when swatching and take a bit of building to get a strong payoff - this is especially so with the brown and black shades (Black Truffle, Suede, Coco, Henna and Sandalwood). In my opinion, the formulation of the mattes is not the best and they are slightly powdery. Unfortunately, I've not had a good experience with it. The matte colours blend to a delightful muddy shade with a few of the mattes being very patchy or not very pigmented. For those that care about fallout, I've not encountered a highly noticeable amount. I have noticed that after blending out the shadows if you try to pack a colour on top to reinforce a colour, it's impossible to do so - this is particularly prominent with the Henna and Sandalwood shades. The colours - my main gripe with these is they are not true to pan. You put them on your eye and they look nothing like what is in the pan. This is true for both the shimmers and the mattes. The hot pink and the black are the only ones that are the same. The black is an effective liner but is very patchy when used as an eyeshadow whether you use a primer or not. The shimmers are vaguely similar to the pan colour but majoritively come out either more pearlescent, golden or silvery. I have also noticed that some of the more vibrant colours can fade within about 4 hours. I have encountered this with the shades Maneater, Bossy, Sandalwood. The shade Dollface and Demure last about 6 hours. The top row of shimmers lasts about 10 hours. The rest of the shadows in this palette have lasted beyond 16 hours. I've tried lots of different combinations of primers/setting sprays to see if this affected the last time. I do like the shimmer colours (top row). I have used them extensively with mattes from other brands and they perform very very well. They do not work with a brush - regardless of whether it is synthetic or not, wet or dry or through using a packing or blending method. They work very well when you use your fingers. I've tried different combinations of primers, foundations, setting sprays and I've even tried different brushes with this palette to see if it was a fault of my application. Sadly, after using this palette for two weeks, I'm still really unsure about it. For how much this palette is, I really wish that I had saved my money as there are so many other palettes that have such similar colours for a lot less. While I love the shimmers, I begrudge paying £56 for the 6 shimmer shades (top row). I cannot say that this palette is anything above, at best, average. You are paying for the HUDA name rather than for what could've been a very stunning upon application palette. The shadows are absolutely pigmented! Feels soft, blends gently. Glitter shadows are better working with a wet brush than with a finger (but it's a personal choice). All in all, absolutely obsessed with the palette. Really good palette. Didn’t have the first one but glad I got this one. 5 star deffo! I am in love with this palette, some of the shades has a fallout,but that is ok and some of the shimmery shades can be used with a brush, but not all of them. I want to love this palette I really do. The colours look better than Desert Dusk, a fab palette, but the pigmentation is not. I find myself having to dig out and plaster on the metallic colours to get any coverage. I've tried using a larger shader, priming my lids, damping the brush, nothing seems to make any difference. I'll keep trying, the colours in the pan look just so lovely. The shadows are so blendable and the pigmentation is amazing. The only downside is that the shimmers are hard to pick up with a brush, but with a bit of fix plus or your fingers, the problem is solved. In love with this palette! The shimmers still don't pick up on the brush. I also feel there is less pigment in them, the mattes are great though but for £56 I don't think it's worth it. Omg, the pigment in this palette is unreal! Just received today and had to have a play. I had the old rose gold palette but did find the textured shadows hard to work with but these... these are SO BUTTERY! Glide on so smooth and the pink diamond shade is stunning! Deffo my favourite. Worth the price 100%. My favourite palette to use. I have had this forever and oh I am never bored of this. Everything about this is perfect. Палетка понравилась, тени легко наносятся.Цвета все яркие и красивые. Впервые решила попробовать эту фирму и не разочаровалась. *** I like the palette, the shadows are easy to apply. The colors are all bright and beautiful. I decided to try this brand for the first time and was not disappointed. I ordered my delivery on the Wednesday and by the Friday it was in my hands, I couldn’t thank the team any more than what I have, they’ve been amazing and I love my pallets they’re incredible 100% recommend. Huda beauty "Rose gold remastered"
It's the worst pallet I have purchased, it cost me 70€, all dark shades leave patches in my eyes, when I use Maneater creates dark brown spots that can't blend the only shadows that improve the situation and cover the mess in my eyes are the shimmery ones, for that price it's extremely disappointing and soooooo not worth to buy. The eyeshadows are lovely and creamy - totally worth the money. The shimmers and foils are best applied with the finger but I don't mind that. Love that it has a mirror. Would recommend! For 56 pounds I expect every single shadow to work. Unfortunately, they don't. I am still trying to find a way to make the shimmers work. I tied dry brushes, wet brushes, fingers but I still can't achieve the colours in the pan. Absolutely gorgeous palette. The colours are very pigmented, long lasting and a little goes a long way. Highly recommend! You won’t be disappointed. 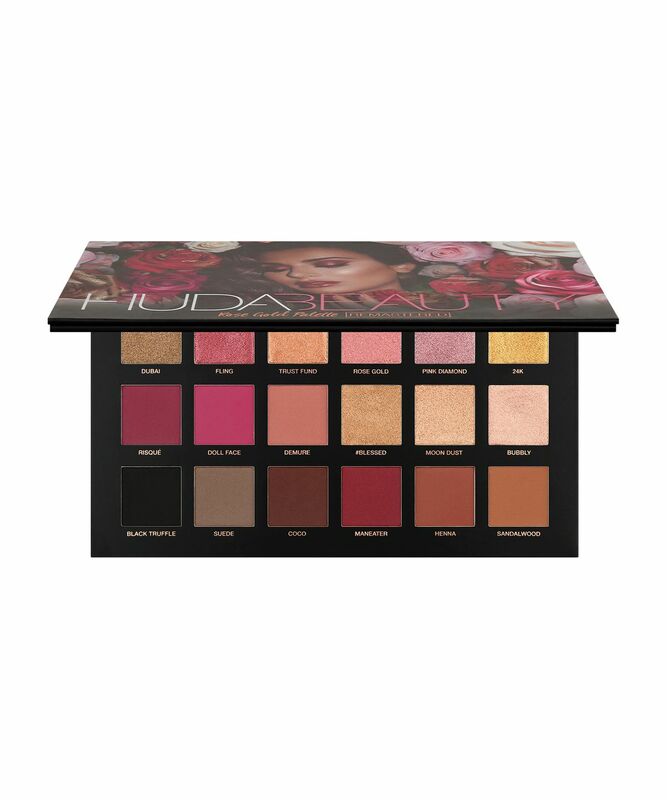 Loooooooove you Huda Beauty, this Palette very beautiful and pigmented, I wish buy a new Palette soon. Отличные тени! Пигментация супер! Очень-очень довольна ими!!! *** Great shadows! Pigmentation super! Very, very pleased with them!!! It is an amazing palette, I cannot say for any other palette that I'm happy to pay double for it if need to buy again. Looooooooovvvvvvvvvvveeeeeeeeeee this. The most buttery palette High pigmentation Just yes yes yes girl But...... the shades moon dust and risqué aren’t as buttery as the rest And the mattes, in general, aren’t as buttery as the shimmers/foils. The colour fades and diffuses. I changed my primer from Urban Decay to Benefit but still had same problem. Highly pigmented and easily blends. The formula, pigmentation and how it applies on the eyes is a lot better than her small obsessions palettes! Love it, good colour selection! Would deffo recommend to someone who was looking for a versatile eyeshadow palette. Well I've been waiting for so long to get the Huda Beauty Rose Gold Palette and I was excited that they're coming out with a Remastered one. Can't deny some of the mattes are kinda patchy and hard to blend out. Like Risque, Demure, Maneater and Suede. I think that's the only problem I have with the mattes, but the colour Henna is sooooo beautiful. It's kinda different than any other brownish colour. Love that colour a lot. The shimmers work best using fingers but for me not really an issue as i always apply any shimmer or foils using my finger. I only gave it a three star because for a very expensive palette, it could've been more better. Some of my cheap palettes blend out better than this one. I don't hate it but could've been better. The shimmers don’t pick up on the brush and they can only be applied with the fingers. Some of the mattes are really patchy. If you want a palette from Huda, the Desert Dusk one is a better choice. I have both of them and this one is a disappointment for me. 2 stars for the packaging. I was hesitant to purchase it as I heard a lot of bad reviews about it but the colours were so beautiful I just can not stop myself. I am so glad I bought it. This palette is everything. You can create so many looks with it. The shadows are super pigmented and they blend effortlessly. Actually, I miss a little bit to blend as I love to blend and enjoy a lot to blend lol. You just pick up your shadow with your brush put it on your eyes and you don't actually need to blend! No joke. Totally worth the price. Even if you in a budget just invest for this palette and you will need nothing other. I have about 20 palettes from other big and great brands but no one is so good like this one. If you're looking for a palette which has everyday shades as well as colours to spice up an eye look then this is a great palette to consider. I had no interest in this palette until it was recommended to me and it has to be one of my favourite purchases of this year so far. The creamy texture, the pigmentation and the colours are all perfect for a beginner as it's easy to blend. I much prefer it over my ABH Modern Renaissance palette as I've also noticed it does not have much kickback unlike the ABH palette and the texture is so much lovelier than any other palette I've used. For the price you pay, the packaging is beautiful and is practical with the mirror provided in the palette at a nice big size too. Not to forget, the pan sizes are bigger than in most palettes so this palette should last a very long time. You obviously need a glitter glue for this to work but once you do, the results are awesome. Very good quality shadows too! LOVE this palette! 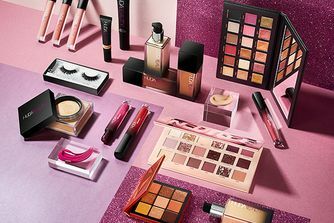 Love Huda Beauty, so great. I recommend. Nice packaging, delivery lead time on time to Malaysia with standard shipping! I so enjoyed using the palette. Thank you! A reminder not to always depend on the opinions of others! So I caved, it was just too pretty like a siren singing to me ‘ignore the bad YouTube reviews foxy’,’buy me foxy’ ‘I will work for you foxy’, Yeah I know palette you got me and I pressed purchase. It arrived I was all set to be disappointed by this time of course, the palette was whispering sweet things, which doesn’t always mean you will be a keeper in the morning, but wait what’s this! Omg my eyes, my eyes they are, stunning!!!!!! bye bye renaissance, this is true magic! I have got few eyeshadow palettes (Morphe, Too Faced, ABH, Nabla) and I think that Huda Rose Gold Remastered is the best of them! I really love it! The shades are dry but so blendable and easy to work :) The shades are very effective and so cute. I think I will buy Desert Dusk too. So pigmented, pretty colors. Worth of money. Love it! I found the colours patchy when blending, there is a lot of fall out, the foil colours dip like they are hollow and after use, they look close to finishing and some of the colours are actually not as pigmented as I expected. I’ve been waiting for this palette to be stocked and it is soo worth the wait. Honestly so so blendable and the pigment so just wow like I tap my brush in and the rest is history. Some similar shade to modern renaissance but the way the shades blend just makes it so much better for me. It is a little expensive but you might as well. It is worth it. The looks I am able to create with this palette are to die for. Omg. This palette. Is SO PIGMENTED. I wasn't able to get my hands on the first one so I grabbed this as soon as it came out and it does not disappoint. The shimmers are creamy and crazy reflective, the mattes are buttery a lot better than MR. Pretty much my go-to now, it's lush, you will not regret it. Totally worth the money and highly recommend.